THE KILLER ROBOTS! CRASH AND BURN Indie Robo-Spectacle Arrives July 15th! 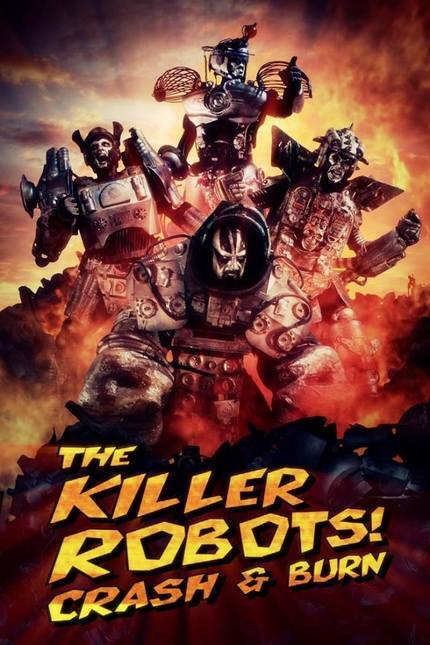 You may have seen the trailer for The Killer Robots! Crash and Burn on this very site a few months back. The 101 minute feature is slated to drop on iTunes and Google Play this Friday, July 15th. Full disclosure - I did direct this film and wish to take this opportunity to introduce it to the world. It is a micro-budget sci-fi epic about a universe of warring robots and mechanical monsters. A lot of time, duct tape and recyclables went into the making of the movie and it just recently won for Best Fantasy at the Supercon Geek Film Festival. Check out the 42 second spot below for a sample. really like this one... watch about a hundred trailors a day, but this ... the best I've seen in the last few years anyway. Shall view in its entirety--- and prolly buy the movie dvd blu-ray bootlegg edition for my extensive collection.